Jose Arias of Bell Gardens in Los Angeles topped a field of 500 to win the $750,000 first-place prize and an Eclipse Award as Handicapper of the Year at this weekend’s 15th annual Daily Racing Form/NTRA National Handicapping Championship (NHC) presented by Racetrack Television Network, Sovereign Stable and Treasure Island Las Vegas. The 36-year-old environmental safety engineer amassed a winning score of $338.20 over the three-day tournament from 45 mythical $2 Win and Place bets – 15 each on Friday and Saturday, 10 in Sunday morning’s Final 50 contest and five in the climactic Final Table contest exclusive to the overall top 10. The NHC was held for the third straight year in the Treasure Island Ballroom. Arias, who qualified for the NHC at Del Mar’s Surfside Race Place, assumed the lead on Day 1’s final mandatory race and never looked back. Going into the NHC’s final race – Race 9 at Santa Anita – Arias held a slim $4.10 lead. His pick in the contest finale, Tribal Smoke, hit the front entering the stretch but was passed and finished third. The race winner, Fit to Rule, was the choice of Tony Brice, who came into the last in third place, $26.60 behind. “I didn’t know because I thought that horse (Fit to Rule) was around 8-1,” Arias said. “Someone in the crowd told me the horse got bet down to 6-1 so I was trying to do the math. Fit to Rule paid $15.60 and $9.80, leaving Brice just $1.20 behind in second with $337. Total winnings this weekend for Arias, including a $6,000 Day 1 bonus he received for registering the top score on Friday, were $756,000. The victory by Arias was a popular one with his fellow handicappers, who swarmed the Final Table with congratulatory hugs and handshakes. A laid-back California guy who rarely betrayed any hint of nerves this weekend, Arias employs a straightforward approach to picking winners. By virtue of his victory, Arias also automatically earns an exemption into next year’s NHC finals. 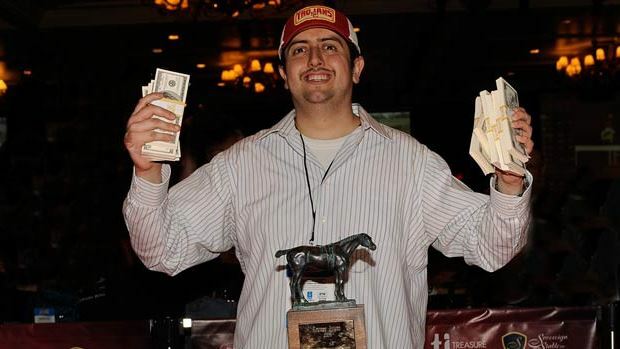 The NHC 15 finals paid out to the top 50 finishers from a total purse of $1,470,000. An additional $75,000 went to the top 20 in today’s Consolation Tournament. Including $247,000 paid out to top finishers in the year-long NHC Tour, plus $30,000 worth of Breeders’ Cup Betting Challenge prizes in the form of entry fees, bankrolls, airfare and hotel, the aggregate payouts this weekend to NHC contestants totaled a record $1,862,000. The highest finish among seven previous NHC winners at this year’s event was recorded by NHC II (2001) champion Judy Wagner, who checked in 12th with a $266 bankroll, good for a $10,800 prize. No one has ever won the NHC more than once in the event’s 15-year history. Full official standings for this weekend’s just completed NHC, including the Consolation Tournament, can be found at www.ntra.com and www.drf.com. More than 3,200 NHC Tour members participated in 2013 qualifiers, hoping to win a coveted spot in the NHC Finals. In its 15th year, the Daily Racing Form/NTRA National Handicapping Championship is the most important tournament of the year for horseplayers. There are no “buy-in” entries at the NHC. It is the culmination of a year-long series of NTRA-sanctioned local tournaments conducted by racetracks, casino racebooks, off-track betting facilities and horse racing and handicapping websites, each of which sends its top qualifiers to the national finals.